I occasionally offer chips to my children because some chips contain MSG (monosodium glutamate) and lack the right amount of nutrition. But with Soyami, I know I can’t go wrong. 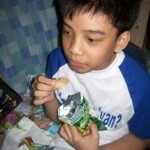 My kids got their first taste of Soyami Soya Chips only this month after I received two large Soyami Soya Chips pouches from the Christmas Party for Mommy Bloggers last December 11. They consumed the Soya Chips in one sitting. They loved it! 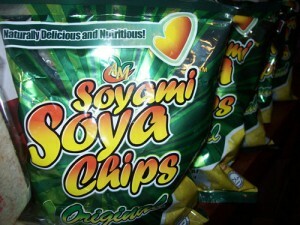 This is a highly recommended snack food as far as the endless health benefits of soya are concerned. Soyami is made from one-hundred real soya. Soyami is available in selected leading supermarkets such as Robinson’s Supermarket, SM Snack Exchange, Puregold, Hi-Top, Land Mark, all Fitness First Branches. Next year, it will available at Rustan’s, Shopwise Branches and other supermarkets. 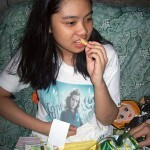 This entry was posted in Healthy food, Product sample and tagged snack food, Soyami, Soyami Soya Chips on December 21, 2010 by Yami.